I hope everyone is enjoying the Thanksgiving holiday. The family gathered up at our house around Noon yesterday and gluttony ensued. The recent temperature drop has left Dianne and I both a little less than eager to get out on the water. However, I could sure use a little paddling action to burn off the excess calories. Last week, while the weather was still warm, I was able to slip out onto the Deep Fork River Bayou area just outside of Okmulgee, Oklahoma for a quick sunset paddle. Yakker even stopped by after work to join in the fun. Yakker usually paddles his Advanced Elements hybrid inflatable kayak, but this time we let him borrow Dianne's Heritage Angler. We were surprised to find a Pulling Unit at work on an oil well about 2 yards from the shore. 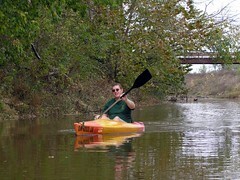 Now THAT is Oklahoma Kayaking! I owed Yakker a favor for helpng me score some cool kayaking gear from the good folks at AE. I took some pictures of his kayak that they wanted to use on their website. The Advanced Elements folks spotted the photos on my Flickr photostream...and the rest is free t-shirts! Speaking of kayaking t-shirts...have you stopped by our Paddlers Supply Store yet? It gathers together loads of great bargains on kayaker t-shirts, paddles, kayaks, GPS gear, kayaking books, canoeing DVD's and more! Definately worth a stop if you are looking for Black Friday bargains online.